If you haven’t already read the last post, you should read it before reading this one. Hockney, Mike (2015-06-02). The War of the Ghosts and Machines (The God Series Book 28) (Kindle Locations 2753-2757). Hyperreality Books. Kindle Edition. “Quite simply, nothing is more important than turning subjective agency and will into mathematical forms and then using them in scientific formulae. We can apply such considerations in all contexts: cosmology, Darwinism, quantum mechanics, as well as psychology and sociology. This is a vastly expanded science, a science capable of addressing mind as well as matter. This is the Holy Grail of the New Science, and it’s a problem that must be cracked before humans can achieve their divine destiny. Hockney, Mike (2015-05-09). Psychophysics (The God Series Book 27) (Kindle Locations 5592-5597). Hyperreality Books. Kindle Edition. Perhaps the best place to start looking for mind in the mechanics currently known to science is in the place where the solution to the Cartesian problem of mind-matter dualism was first solved. There is no known indication (to this author at least) that the fellow who discovered the solution to the mind-matter substance dualism problem was thinking in those terms, but at the same time, there is something remarkably uncanny that the fellow in question intuited this solution for the particular problem he had been working on. Joseph Fourier discovered the Fourier Transform, the transform which is now known as the solution to the classical problem of mind-matter dualism, in his pursuit to understand problems of heat flow, i.e. in thermodynamics. I must admit that I have not ever read a biography or detailed historical account of Fourier’s discovery, other than learning about the procedure in textbooks, but it is clear now that such an account will one day be one of the most cherished sequences of historical events and thoughts ever to be held in a person’s work. One day, every single person alive will be fascinatedly humbled at the sequence of thoughts that developed in Joseph Fourier’s research during his discovery of noumenal wave mechanics and the subsequent Transform which bears his name. Hockney, Mike (2015-01-09). The Science of Monads (The God Series Book 24) (Kindle Locations 434-436). Hyperreality Books. Kindle Edition. Photons are the essence of causation. Light causes everything. There is nothing but light – orthogonal light (mind) and non-orthogonal light (matter). Truth resides in light and falsehood in broken light (darkness, the material world). Light is about rationalism and idealism. Broken light is about empiricism and materialism. A soul is a single instance of the electromagnetic spectrum. The electromagnetic spectrum is continuous, massless, immaterial and dimensionless. It’s an energy plenum. Light is pure energy outside space and time (dimensionless energy), while mass is impure energy (dimensional energy), forced into the spacetime framework, which turns it from thought into unthinking matter. Spacetime “breaks” light. The frequency domain restores it. Hockney, Mike (2014-11-03). Causation and the Principle of Sufficient Reason (The God Series Book 21) (Kindle Locations 555-573). Hyperreality Books. Kindle Edition. They suppose that, because we can’t say how a photon knows not to do this, that it therefore must. However, the reasoning here is of course specious, and sophistical, the least reason of which because in science it is not required for anything to have any knowledge at all – everything plays out materialistically and mechanically, based on laws of physics. Knowledge, the requirement to know to do something or not do it, is a direct implication of mind and is specifically rejected by the scientific materialist Malthusian climate alarmists. And furthermore, their question can be inverted: instead of asking how something knows not to do something, we can ask them how anything knows to do anything at all? How does a planet know to follow an orbit based on an inverse square law of attraction to a star…or how does it know to not not do this? Or an even better example: How does a photon know to take the path required in a chloroplast to result in photosynthesis, and life? Or what about phenomena which follow the Principle of Least Action: how do they know to do this, given that this is merely a mathematical principle and in order to follow it you must in some way know mathematics? Knowledge of anything requires the existence of mind, and ontological mind is specifically rejected by science with mind only arising as an accidental epiphenomenon of a particular accidental and temporary, but complex, arrangement of matter found in humans and possibly some animals. No mind can exist at such a simple level of physics as a photon, let alone an inorganic collection of atoms, yet in either case heat only flows from hot to cold despite the two-way coupling of energy in either radiative or conductive thermal energy exchange, and, photons do take the path required to result in photosynthesis, and various other phenomena do follow fixed mathematics principles even though no mental agency is said to be present to follow them. Hockney, Mike (2015-06-02). The War of the Ghosts and Machines (The God Series Book 28) (Kindle Locations 5041-5046). Hyperreality Books. Kindle Edition. In the God Series we learn that Ontological Mathematics, Mind, Light, and Energy are all synonymous terms…they all refer to the same thing, and they all partake of the form of the God Equation. Since thermodynamics is simply all about the behavior of energy, and this is where the Fourier Transform originated, might we find evidence of mind in the study of heat flow? The radiative greenhouse effect of climate alarm (and environmentalist psychopathy) follows a mechanistic formula predicated on the impossibility for the matter and energy of which science studies to be able to know what it must do. Again, this is a totally paradoxical postulate given that, in scientific materialism, matter & energy follow the laws of physics without having to “know” that they’re supposed to. As we will soon see, paradox and incoherence is the very basis of climate alarm. 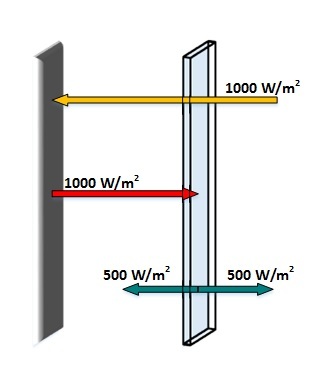 The radiative greenhouse effect begins with the following problem depicted in the image below: Shortwave radiation passes through a substance (in this case, a pane of glass) of which it is transparent, and is then absorbed by another surface further on. The shortwave-absorbing surface (shortwave surface henceforth) is insulated on its backside. The shortwave surface then thermally radiates the input energy back out in one direction only, but at longwave frequencies to which the other substance or layer is now opaque. Thus, the other layer absorbs the longwave radiation from the shortwave-absorbing surface. 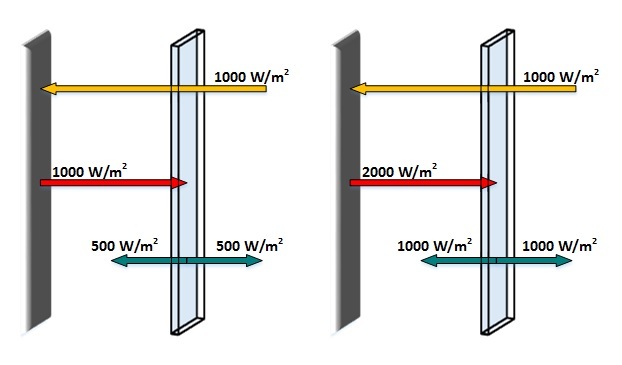 At this point, the longwave layer emits it own thermal radiation, but it must emit in two directions because it is not insulated on either side. The longwave layer thus emits back towards the shortwave surface and also back to outer space, and so to conserve energy it only emits half of the energy it absorbs to either of those directions. At this point, total energy is not conserved to the outside of the system because only half of the input energy is making it back out to outer space. So, how do we proceed? In just two iterations of the mechanist’s logic shown in the diagram above we arrive at a violation of the 1st Law of Thermodynamics: more energy is output to space then was put in. 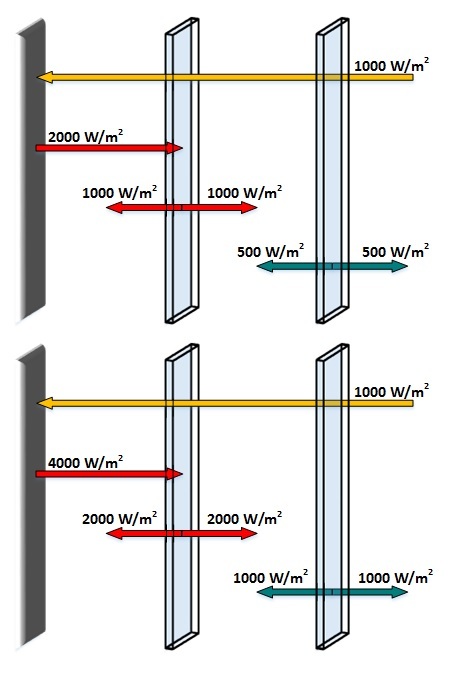 Following the mechanist’s own logic that all photons must cause temperature increase regardless of their source and the rules of heat flow (since knowledge of their own source or the rules of heat flow can not be “known” by photons), then the energy emitted by the longwave layer must be absorbed by the shortwave surface and thus increase its temperature. In this way, the total output from the longwave layer to outer space begins to approach the input energy to this system. This is what we see in the left-half of the above diagram. However, if we repeat that procedure one more time since we have to by the mechanist’s own logic, then we arrive at the right-half of the diagram where the violation of the laws of physics is mathematically exposed by this specious scheme’s own logic: More energy is output than is input. The iterations could of course be continued, and they should be indefinitely given the mechanist’s logic, and it demonstrates the run-away heating problem of this argument for the radiative greenhouse effect because if cold warms hot, then as hot warms cold, cold will warm hot some more, leading to hot heating cold more…ad infinitum. The mechanist’s previous logic that the emission from the longwave layer has to add to the shortwave surface independent of any requirement for heat flow directionality can no longer even be applied in the above diagram’s scheme. The end-point has 1000 W/m2 impinging the shortwave surface but it has no effect, no longer adding to it. The radiative greenhouse argument has actually completely shifted its goal posts and its entire underlying ontology. Now, it is not that the emission from the cooler layer has to add back to the warmer layer since photons from the cooler layer can not “know” that they are not supposed to do that, but rather, it is that the external shortwave input continues to “build up” and increase the temperature of the shortwave layer beyond the temperature of the shortwave energy’s own energy flux density, until the point at which the outer longwave layer is emitting the same total energy as the shortwave input. This is a totally contradictory ontology compared to their previous requirement, and it has no mention of nor even any necessity that the photons from the cooler layer heat up the warmer layer – all heating is taken care of by the external input, and the cooler longwave layer need not ever send any heat to the warmer shortwave surface at all. These arguments are not compatible with each other, for example with some of the extra internal heating effect being caused by “backradiation” and some of the extra heating being caused by the external input; either all of the photons don’t know that they’re not supposed to transfer heat from cold to hot or they don’t, and either the external input is what gets concentrated to levels beyond the temperature of its own energy flux density, or it doesn’t. If you try to combine the arguments then you still get lead to the violation of the 1st Law of Thermodynamics as in the first argument, and so you can not only partially utilize the first argument. As we can see, the bottom layer energy density increases as 2n where n is the number of layers. For 1000 W/m2 as the absorbed input, which is equivalent to a temperature forcing of 910C (1960F), then with 5 layers we can amplify the temperature to 5940C (11010F). Half the trouble is figuring out how exactly these guys are wrong when they come up with their schemes to cause heat to be amplified with no additional heat source input…it’s such an obvious violation of thermodynamics that you’re left confused as to how they can be thinking in the way that they do, and then explaining it to them. 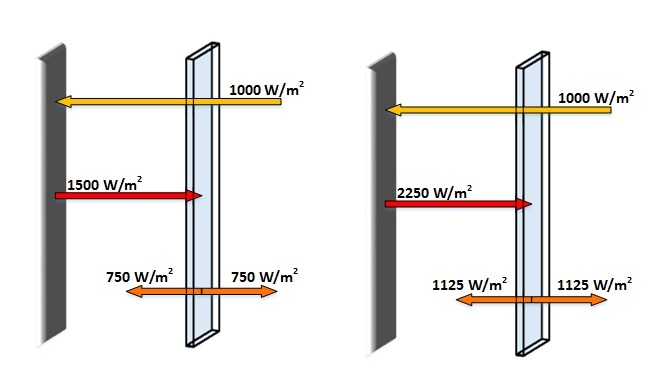 Anyway, the outer pane needs to emit the 1000 W/m2 to the outside, but they say it will also transfer that to the inside, thus the outer panel requires an input from the inner panel of 2000 W/m2. So the inner panel will need to emit 2000 W/m2 to the outer panel, but, it will also have to transfer this to its own inner panel relative to it and so it emits 4000 W/m2 total. If it emits 4000 W/m2 in total but receives only 1000 W/m2 from the outer panel, then it needs to get 3000 W/m2 from the next inner panel, etc. So it’s not a power-law increase but an a multiplicative increase with the number of panels. The final temperature for 5 layers is then 5700K or 2970C or 5660F. See the next post for discussion of this in a paper. The radiative greenhouse effect of climate science is still debunked. The point to understand here is that at no point can the power being expressed inside the device exceed that of the input power source itself…see the next figure coming up below. Hockney, Mike (2015-06-02). The War of the Ghosts and Machines (The God Series Book 28) (Kindle Locations 4922-4933). Hyperreality Books. Kindle Edition. As discussed in the last post, Joseph Fourier and his friend Horace-Bénédict de Saussure already empirically tested this exact scenario hundreds of years ago when Fourier was doing his work on thermodynamics and developing his Fourier Transform. They did not find the results that the mind-denying Malthusian climate alarmist faithers claim should have been the result, with their “radiative greenhouse effect” upon which their alarm is based. Instead, Fourier and de Saussure found that the bottom layer temperature only reached the temperature of the external input forcing, from the sunshine alone itself. This means that the other layers only acted as insulation, rather than as temperature amplifiers. This is important for Fourier because it has an effect on the boundary conditions that are required for a successful analytical or numerical model solution to the thermodynamic problem when treated via the Fourier Transform. This result is the total ontological debunk of the Radiative Greenhouse Effect, and the Anthropogenic Climate Alarm which is 100% dependent upon it. The point to understand here is that at no point can the power being expressed inside the device exceed that of the input power source itself. The difference between the alarmist amplification result and the ontological insulative result is effectively the difference between treating photons as fermions vs. treating them as bosons, and photons are of course bosons. To produce temperature amplification, the photons are effectively thought to build up like hard little atoms and to push against each other (like fermions do) until sufficient internal pressure is established to result in the same number of photons being squeezed out of the exterior as is input to the interior. The insulative result, on the other hand, allows photons to overlap each other (as bosons do) and only allows photons of higher frequency (= higher energy = higher temperature) to cause temperature increase. Mathematically, the numerical solution for the boundary conditions for the amplification result and for the insulative result are as follows below, and this is part of the code that was used to produce the animations in the previous post; “ins” is a Boolean switch to set the model as insulative or not, where “not insulative” (~ins) then of course means amplificative. The amplification result conserves energy by effectively treating photons as fermions, whereas the insulative result treats photons as bosons and conserves energy after that, thus producing a different behaviour. I suppose that it now seems obvious that light, energy, mind, agency, free will, and ontological mathematics, are all synonymous. Anyway, the research on what underlies the obvious fraud of global warming alarm is now complete. And it has connected up with something which I had not expected. Eventually I will write a scientific paper for “peer-review publication” (not that that actually means anything…but it’s what the morons require) exposing all this, without of course the direct references to ontological mathematics, mind, etc…as that would simply be too much for them to handle all at once. The paper is already half-way complete actually. Gallery | This entry was posted in Fraud of the Greenhouse Effect, Illuminism and tagged Fourier, Fourier Transform, Joseph Fourier. Bookmark the permalink. It’s good to hear that you are going to get this published. Good luck with it. Cheers Phillip. The truth will out! Will this not nullify warmist theory? I’m not sure. I think Fourier and de Saussure already showed how, and already did it.